Midwest Tape marketing specialist Chris Shope recently interviewed Louise Harrison, sister of Beatle George Harrison, and two-time Grammy Award-winning producer Dennis Scott about their new Grammy-nominated album, Fab Fan Memories, as well as their Help Keep Music Alive organization, George Harrison, and the Beatles. Broken into four parts, below is the first portion of our interview. Chris: Hi Louise, this is Chris Shope at Midwest Tape. How are you today? Louise: Oh, I’m fine. How are you? Chris: I’m great, thanks! Thank you so much for taking the time to talk with us today. Louise: No problem. I just got back from Chicago. We just did two concerts at the weekend for Help Keep Music Alive. We did two high schools. That was a lot of fun and very, very successful. Dennis: How did the kids play? Did they do a good job? Louise: They are incredible. Not every single note out of their mouths is absolutely perfect, but it was such a tremendous atmosphere, all of these kids being so excited to be part of a real concert. It’s just wonderful, wonderful. You stand there and watch the kids, and you have chills all up and down your arms; all the hairs are standing on end. It’s just really, really wonderful. Chris: I love the passion and joy kids bring to music. Louise: That’s why it’s so important that we’re doing what we’re doing. With the way things are financially now all across the country, many of kids are deprived of any opportunity to learn music. Louise: I know we can’t do an awful lot to help, but at least we’ll do whatever we can. Chris: It’s wonderful to hear about someone who’s done so many awesome things giving back to the kids. Well, we here at Midwest Tape work hand-in-hand with libraries to help them achieve many of their goals. I think they’d be really interested to hear your new album, Fan Fab Memories, and what you guys would have to say about it. Louise: Well I certainly enjoyed being able to participate in [the album] because for the last 48 years now I’ve been very much the mum of the global family of Beatles people. For me it’s always a great pleasure to be able to interact with all of the fans across the world and to be the mum figure. I’ve really enjoyed being part of it. All of the people I’ve sent [the album] to so far have really enjoyed it, including my friend Angie McCartney, the second wife of Paul’s dad. She has a media company and wants to get the word out about it, too. It’s very much a network of people that you meet up with. Some of the people you’ve known in the past because we’re all on the same wavelength and we’re all basically trying to put across the same message of love and peace and harmony and all of that kind of stuff. It’s only natural that we meet up with each other from time to time. Chris: The energy just pulls people together. Chris: Now how did you and Dennis meet? Louise: Well, we haven’t met yet, have we, Dennis? Dennis: We haven’t met face-to-face yet but I feel like I’ve known Louise for a while now. She’s so congenial and it’s such an honor to work with her. I never dreamed, before I met her, that she had such a great broadcast background and experience. The moment we started recording together, all I had to do was turn the tape recorder on and let her do her thing. It was brilliant; it was exactly what the album needed. She’s the glue that holds the rest of the album together. Louise: I’m glad I’ve finally reached my pinnacle; I’ve now become the glue. Dennis: It’s even better than Elmer’s glue. It’s Louise glue. Louise: Well, my name is Lou to begin with. Chris: So what about the project most appealed to you, Louise? Louise: Being able to be part of something where the fans get a chance to be heard in a really nice format. If you say anything nice about me it’s because I take after my parents, they expected me to behave. For years and years and years, they were the original mum and dad of the family of Beatles people all over the planet. They answered hundreds of thousands of fan letters over the years, and they encouraged me to always give back the love. So, it’s being able to be part of that, and being able to allow the fans themselves to express what they have felt over the years, and how much the Beatles have meant in a positive way in many people’s lives. It’s really great to know that it’s still going on. And at our shows we have kids that are four or five years old, and they’re enjoying the whole positive experience of Beatles music as well. I’m just hopeful that it will keep on going and maybe improve this awful world that we’re getting into these days and make it get to be a little better. Chris: It’s wonderful that you have embraced that role. Louise: Absolutely. I didn’t have anything else to do (sarcasm). Dennis: I’m sure that’s true (sarcasm). She’s always on the go. Chris: What are the main characteristics that make up the bond that Beatles fans share? Louise: Well, to me, I’ve found there are definitely two different kinds of people in the world, and you see that in politics, too. The people who are Beatles people have a tendency to be positive people and have hope and vision for the future and have compassion and friendliness and kindness in their hearts. Those are Beatles people. And I’m very fortunate, because of my Beatles relationship, that those are the kind of people that I spend most of my time talking to. I mean I occasionally run into somebody who hates the Beatles but it seems people like that, they hate everything. We’re seeing it in today’s world where there are a whole section of people who just hate everything, and you can’t change them, unfortunately. Chris: But it’s great that the Beatles sort of gave a voice to all of the positive people. Dennis: I’ve only met one person who did not like the Beatles and he’s kind of a sourpuss. He’s a very talented musical arranger but he just didn’t get the Beatles. I’m surprised because I figured the more musical you are, the more you would appreciate their musicality, but there’s one in every crowd. So, let’s just focus on the positive people. Louise: Yes, the thing to do I think is rallying together all of the people who are part of it. And I see it happening now, too, across the world, because the people who are the real people are the backbone of every country. They’re getting up and saying "hey, notice us, we’re the ones that are making it all happen. Pay a little attention to us and give us a break now and again." And I’m just very, very encouraged that apathy seems to have gone out the window and people are taking an interest in what’s happening in their lives and speaking out. I’m going to be going to New York next week and I’ve asked if I can meet some of the people that are out on the streets and say hello to them. Dennis: Louise, we should give you a tape recorder, and you can do Fab Fan Memories, Volume Two. Louise: Hey, that’s a thought! I’ll get to be amongst them because I emailed someone this morning who’s setting up all of the media for me in New York. I said,"if you can, get me down there to talk to the people because if John [Lennon] was alive he’d be there leading them in singing 'Imagine.'" This has been part one of our four-part interview with Louise Harrison and Dennis Scott. Be sure to visit News & Views on Thursday to read part two of our interview. 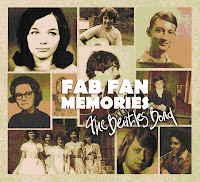 In the meantime, shop Fab Fan Memories and Beatles music and DVDs. You can also learn more about Louise's organization, Help Keep Music Alive, by visiting their website or Facebook page.